Spent twenty-seven hours away from my family but with my friends!!! Yipppeeee!!!! Enjoyed a little wine tasting. Spent a few hours at the spa. Drank some wine. 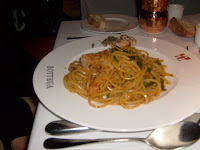 Then enjoyed a most fabulous dinner at Bottega in Yountville. My new best friend, Michael Chiarello joined us for a drink. The service was just wonderful. 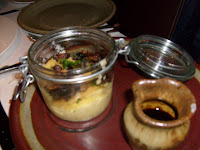 The food beyond good. The atmosphere was perfect. I can't say enough about how much I enjoyed my evening. We all did! Famous people were everywhere. William Fichtner was two tables over with his "entourage." I spent almost every weekday afternoon of my college life (except when I was in class of course!) watching this man on As the World Turns. He was the lost soul, Josh Snyder and he died, and I died and then he was reincarnated as Grace's boyfriend on Grace Under Fire and all was well with the world. He went on to star in other TV series such as Prison Break and movies like The Perfect Storm. He seemed a little drunk, and his friends, even more obnoxious. It didn't bother my new BFF. 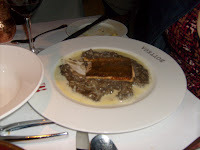 He just ran his restaurant and cooked his miraculous food. What a great night! And I worked hard for my food, and it was worth it! Taking a few days. See you on the flip side with more fodder and fun! We have no Internet, phone or cable. Could care less about phone but no tv and no Internet. iPhone is saving me now, but just so you know, comcast you are on my list. An outage, no outage? No one available until noon tomorrow? Really? You are on notice! If I can remember that this was the plan, I am implementing Fantabulous Tuesdays. 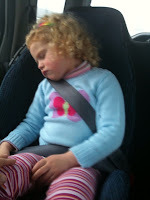 Video only days in which I show off the intelligence, artistic superiority and other wonderful attributes of my children. 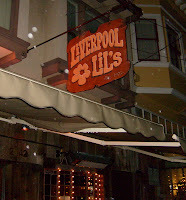 One of Victoria's favorite places to go for a good meal and good service was Liverpool Lil's. We honor her here, here and in our hearts. Tonight I met some friends for drinks and dinner. We enjoyed eachother's company; talked of lives and children. We mourn the passing of Victoria by realizing the potential of the future. Our dear family friend passed away this morning. 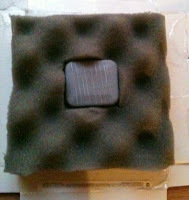 It was time, as she was very old and very sick. We mourn her but know she is in a better place with her mom and brother whom she mourned every day of her life after their passing. In this lovely lady's honor, find some people you love very much and give them a hug and tell them you love them. What a Saturday! Jeff and I enjoyed great times with each other and the kids. 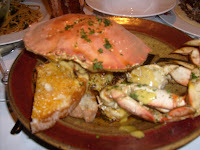 Dinner was just wonderful, hah!! We are about to watch this movie. I am scared that I will hate it, but it will be nothing like the fright in Lilly's eyes at the end of the kids' bath this evening. James stood up, pooped and then started splashing. From there, it was a whirlwind of rewashing, plunging and sanitizing. Kids clean, in bed and Jeff and I are ready to relax! Don't put your finger in the dog's eye. I am not making aspic for dinner. I will never take another bath with him. GAGA GOO GOO, Daddy, mommy. You think I am kidding? We have been inundated with horrible storms of rain and hail this past week. 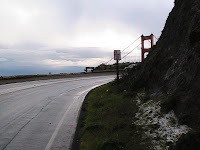 And then, this morning, there was snow and ice ON THE GOLDEN GATE BRIDGE. Not just hail, but snow and ice. There were signs telling us CAUTION, ICY ROAD AHEAD, on the Golden Gate Bridge. I slowed down, giggled and tried to figure out how to take a picture of the ice and snow while not crashing the car. Instead of risking life and limb and my childrens' lives, I took mental photos and planned on stopping on the way back home to take pictures. Well, it started raining and the wind almost blew the car off the road, so I just went home, googled the whole experience and found documentation. Have you ever seen so much snow? The plows are on their way. Salt on the road is sure to follow. Let's be honest, this is nothing for those who live in the Alps, or even Sacramento. But for us, SNOW? What? Hello? Let's skip to 3:00pm. The sun was reflecting off the flood waters at Richardson Bay, and it was time for Ballet Dancing for preschoolers! There was twirling, skipping and just all around fun! I mean seriously, this kid, she is a star! One of our great friends couldn't make the recital because she was suffering in a Tropical Island. 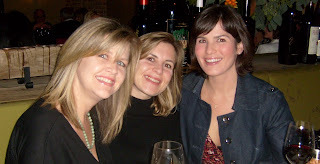 Her friends missed her greatly. Not sure she missed anyone! And the day ended with a wonderful dinner full of gossip and throwing of food. 1/2 off Entrees during happy hour takes on a new meaning when you bring the kids. So, the entire time I have been putting heart and soul into this post, HOPE FOR HAITI has been on every single channel on the face of the universe. Pretty sure the moon is showing it on the big screen. I can NOT watch it. I am a baby. A wimp. A pretty sad excuse. However, I donate. Money, send money. This is what they need. Watch the music, enjoy the celebrities and DONATE your money. (And if you are faint of heart, do not listen to Tom Hanks, just give money. The story he is telling RIGHT NOW broke my heart. BROKE IT! But I gave money. YOU DO THE SAME.) Watch Rihanna, Jay Z and Bono. WOW!!! Oh boy, it's Dave Matthews. Oh, and Neil Young. I will stop now. Ok, I am beside myself. Jennifer Aniston, AND STEVIE WONDER are answering phones. I am going to turn off the tv, but I will post these links, as I have over the past week, so you can donate to help this country, these people and these children. Give what you can and pray for peace. I have absolutely nothing to say. OK, maybe a few things. Oh, and that other thing too! I learned about this boy today, Killian Mansfield. His life was inspiring, beautiful and full of music. 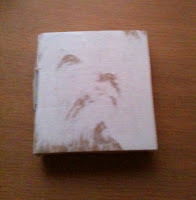 Listen to his story and then a tune from his album, Somewhere Else, and if so inspired, go buy the cd. I know one person who feels addicted to the music and probably the story as well. Everyday I find happiness and giggles online. The sites I visit range from the local news to the raunchiest, yet guffaw inducing mommy blog. Oh, and then there is her! In between there are political bloggers who fuel my spirit and make me think. There are foodies that make me want to dance through the farmers' market with my pretend wealth and buy everything local. 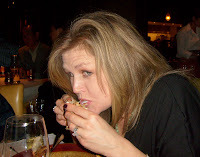 And there are writers who aren't really foodies but use a domain name that makes one think they are reading about food, but turns out it is about being a mom with a sense of humor that has no description! There are bloggers and social media mavens who do both. And her, she made me cry and remember to be proud because she triumphs everyday at what she does! 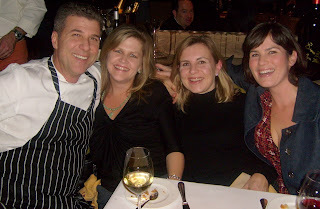 I get a wealth of information from writers who explore cooking and raising children with love and intelligence. Dads who feel honored to be the one to stay home and take care of their kids. And then there is my newest find. I heart her. She is wonderful, a hoot and she cares! There are so many more sites I visit. I am honored to be part of their lives through the internet. This medium offers us so much, and so little. Take the time to figure out where you belong and then search away. 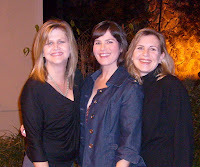 You will find a community of best friends you will never meet. I promise. I am INSPIRED by those who share their failures and more importantly, their triumphs. 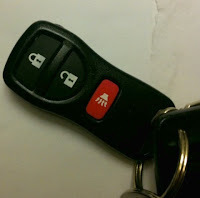 One final note: since we went from two cars to one, we have been living with a car that will only open with a key or a FOB (not sure what this means, but Jeff keeps referring to it this way, so I will too) that doesn't attach to anything. I know, this is crazy. It was driving me crazy, and I was driving Jeff crazy. Today in the mail, a miracle arrived. Thank you, thank you and thank you more. My concern about how to get in a car without the luxury of a FOB, for goodness sakes is trivial. Small and inconsequential. I remember this as I continue to see and read all the news stories about the 1.2 million homeless in Haiti. The 250,000 dead and even more injured. There is a fund-raising concert in the works from artists in LALA land and around the world. In the meantime, take time to contribute what you can and PRAY for these people. Peace, health and patience for time and healing. MY LAST THOUGHT: ARE BONES AND BOOTH EVER GOING TO GET TOGETHER? I MEAN REALLY, IT IS GETTING OLD! My Last Last Thought: I do spend a lot of time surfing the net. It is my vice and it occurs AFTER the kiddos are in bed. Just so you know! Since I have been blogging seriously, the past probably six months or so, my family has become used to my picture taking and video stalking. A good example is trying to take a picture of Lilly's beautiful curls for an entire rant on how hair is so great, yet such a pain. Instead of standing still and being the perfect little girl that she is , she proceeds to launch into supermodel mode complete with throwing her head back and shaking her hair in the "wind." 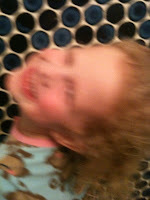 All of this results in a weird, blurry somewhat beautiful picture. And then there is trying to capture the craziness that is our dinnertime. Watch closely as everyone looks directly into the camera and "acts" on cue. Everyone but Jeff. Notice his "ENOUGH!" It was directed toward the kid, but it was meant for me. It might be time for me to start leaving him out of my FODDER! One thing I will not leave him out of is my need for new stuff. I love to buy clothes, shoes and home accessories, but we have neither the money nor the time to buy any, or all of these. I am a glutton for H&M, Forever 21 (and now that both are carrying kids clothes, they might be my favorite places on earth). However, recent media outlets have reported VERY BAD business practices on the part of stores like H&M and Wal-Mart. I will leave a Wal-Mart discussion for another day, but I DO NOT SHOP AT WAL-MART. There isn't one close to me so it isn't an option anyway.. I will leave it at that. This being said, where do I find great clothes or accessories at reasonable prices? Target? Maybe sometimes. But original items that no one else has? Search the blogs for great finds that are original, that fit you in fashion and in the mind; that inspire you. Support those who take the time to create, shop and post. These are just a few out there. Search Google, or Yahoo, or Netscape (oops) and find what you want. Try to think outside your norm, find a new way to shop by supporting the artists, old and new. And once again, please remember Haiti. The babies, the parents, the entire community. They need your prayers and your help. Today was a little hard. Not hard like it coulda' killed me hard, but it was long. Involved a lot of weather, driving, waiting and yes eating. Most Tuesdays James and I stay home, or get out of the house for alone time while my mom takes Lilly to Spazio to play and learn Italian. My family is not Italian and certainly not Italian speakers. In fact there are a few of us who barely speak English! :) We just like the class, the teacher and the people. Lilly thrives, gets one on one time with my mom in the morning, and my dad in the afternoon. It is great for everyone. James and I also get some one on one time which is essential for the nourishment of our relationship. Most Tuesdays it works. Today was different. First of all, the day started off with a typhoon. We have been waiting for the big storms, and we certainly were not disappointed! 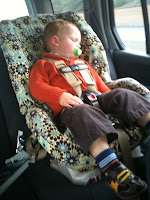 After finally arriving at Spazio to drop off Lilly in our car/boat, James and I tried to go to breakfast. Two restaurants and a tour of the city later, we arrived at Bay Watch to enjoy our breakfast, which was actually our lunch since it was already 11am by this point! I was not disappointed in my meal, or the price so I consider the morning a victory! Thanks Seana for the recommendation. The rest of the day was full of work, non-napping, a TWO HOUR WAIT AT THE DOCTOR FOR BOOSTER SHOTS, a stressful but yummy Korean dinner and an unbelievable traffic jam . After a U-Turn in the middle of 19th avenue over a median and a short cut through the Presidio, we finally made it home. I am pretty much done with this day. Tired, but happy. Not quite relaxed, but working on it! Please don't forget the plight of the Haitians. As time passes and headlines fade away, they will still need help. I continue to research and find worthwhile charities that pledge, and have proven track records, of providing directly to the people that need it. 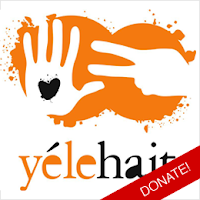 Please note, my newest charity, Yele Haiti has received some negative press. None of this has been substantiated; quite the contrary. They are in the trenches of Haiti bringing aid! I believe and trust in each charity I chose to highlight. The rains have arrived. Ok, the winds have arrived with a few rains, but I sense many more drops in our future. It was supposed to start on Saturday, but as of now, we have been spared any big rains. This will change I am sure. My deep understanding of everything meteorology is key here. Or rather I listen to the weatherman on channel 2, and this is what he said. I believe him. Maybe. 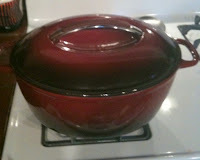 Since the weather is so frightful, I decided to break out my new, beautiful dutch oven (Thanks Grandma Linda!) and make homemade Chicken Noodle soup. 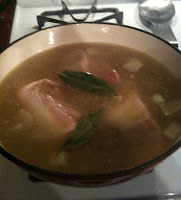 This need to cook said soup all started Saturday when I watched America's Test Kitchen. They claimed you could use canned stock with a few additions to make great Chicken Noodle Soup. I trust ATK as they know everything when it comes to cooking. I mean Chris Kimball wears a bow-tie for goodness sakes. Remember Paul Simon? He too wore a bow-tie. He didn't become our president but he knew a lot of things. However, I digress. 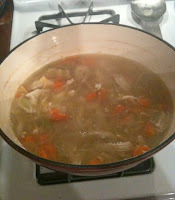 My point is, you CAN make great chicken noodle soup without having to make homemade chicken stock. It does take a little extra work. Yes, it is harder than opening a can of Progresso, but it was worth it. Jeff and Lilly said so. Or at least they knew to agree with me when I said it! James would have agreed, but he likes to eat ketchup with his hands and then put the ketchup in his ear, so we don't listen to his critiques of my cooking. OK, it did take four hours but this was of my own making. Totally not ATK's fault. And, for those readers of mine who are going to Hawaii: HAVE FUN! RELAX! ENJOY YOUR FAMILY, THE SUNSHINE AND FOR THE LOVE OF ALL THINGS SACRED, PLEASE STAY HEALTHY! This one's for you! And please continue to do good will and donate and pray and hope for a new beginning for Haiti! 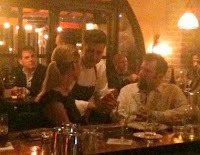 I love celebrity gossip and sightings and such, until I don't. I realize this makes no sense, but in my head it does. I only like said events and "newsworthy" extravaganzas when it interests me. The Golden Globes do not interest me. This being said, what was everyone wearing and who walked whom down the red carpet? I will check with DListed tomorrow to get the lowdown. Here in normal people land, it is Sunday, the day of the Lord, and we skipped church. Why? Well, let me tell you. I wanted to have a family adventure this weekend and our trip to the grocery and hardware store as a unit yesterday did NOT cut it. 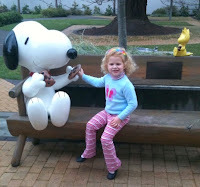 So today, we took off at about 9am and ended up in Santa Rosa at Charles Schulz's Museum. We went for a pancake breakfast and an Ice Skating Adventure. 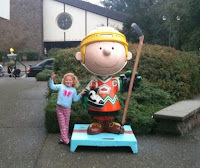 We met some of our great friends, and enjoyed a wonderful Sunday of friendship, skating and Snoopy. 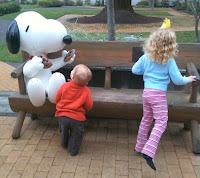 And yes, one hour from our home there is a museum of the Peanuts. Snoopy is from Santa Rosa, CA. He has an ice rink and a cafe. HOW MUCH FUN! If you live in Northern California and have the time, please go visit this place. It is awesome. What a wonderful tribute to a true artist and to his hometown. Good times were had by all! And then we were tired. Once Again, I am providing these links for d0nating to the people of Haiti. Please remember to do your own research, but rest assured that I have done my due diligence here. Each one of these organizations will do their absolute best to give 100% of donations DIRECTLY to the people of Haiti. It is up to you to to provide hope and strength to this nation in trouble.